A Roman-era mausoleum was discovered near a hill partially destroyed by treasure hunters in Turkey's central Kayseri province, reports said Friday. 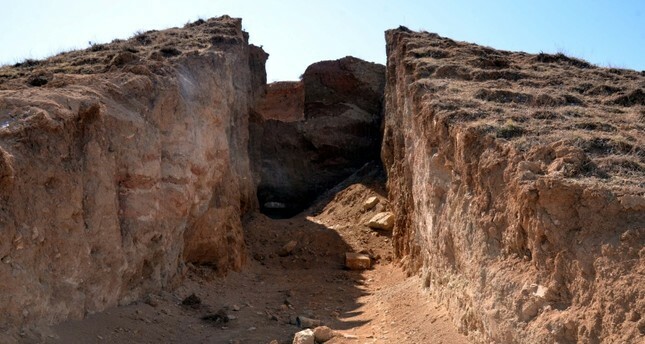 The ancient grave was found in Sarıoğlan district, where treasure hunters divided a hill into two using a grader. Locals reportedly called authorities upon seeing the destruction, reports said. Gendarmerie and museum directorate officials arrived at the scene for examination and noted that there was a mausoleum. Officials noted that the area has been designated as an archaeological site protected by the state, and museum officials will carry out excavations to find out more about the ancient grave.